Video clip synopsis – Streeton's eyewitness account of the death of a workman during the blasting of a railway tunnel at Lapstone in the NSW Blue Mountains. 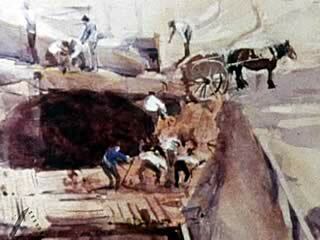 It becomes the inspiration for his painting "Fire's on, Lapstone Tunnel". Broadband MP4 streeton_bb.mp4 (9.0MB), suitable for iPods and computer downloads. Death of a Workman In A Streeton Painting is an excerpt from the film Fire’s On, Lapstone Tunnel , part of The Australian Eye Series : Australian Impressionists 1888-1896 (66 mins), produced in 1984. Fire’s On, Lapstone Tunnel: The death of a workman during blasting of the railway tunnel at Lapstone in the NSW Blue Mountains in 1891 was Arthur Streeton’s inspiration for this painting. Streeton’s vivid description of the accident in a letter to his artist friend Tom Roberts is included in the commentary. The Australian Eye Series: Based on the principle that the more one knows about a work of art the better one can appreciate it, this series makes a detailed examination of many of Australia’s most outstanding paintings. Besides scrutinising one key work in close detail, each film reveals, wherever possible, the artist’s drawings and studies for that work, and shows other related works. Many little known paintings from private collections have been included. Living artists have been recorded, talking about their techniques and the ideas behind their paintings. The letters and journals of earlier artists are drawn on, as well as the views of critics of the day. Every film was made in consultation with a leading expert on the artist, and scripts were discussed with the Education Department of NSW prior to production. The series consultant was Daniel Thomas, Curator of Australian Art at the Australian National Gallery, Canberra. The Australian Eye Series was produced by The Art Gallery of New South Wales and the Art Gallery Society of New South Wales in collaboration with Film Australia. Reading standard: Students read, view, analyse, critique, reflect on and discuss contemporary and classical imaginative texts that explore personal, social, cultural and political issues of significance in their own lives. They select subject matter and begin to use a range of language techniques to try to position readers to accept particular views of people, characters, events, ideas and information. Speaking and listening standard: Students analyse critically the relationship between texts, contexts, speakers and listeners in a range of situations. Arthur Streeton was one of the 'Heidelberg School’ of Australian artists of the 1880s who popularised the painting of romantic yet realistic images of the Australian bush, and the open air, in an 'impressionist’ style that acknowledged and emphasised the Australian light and colour. “This morning, hot, windy, and warm, as I travel down the line, and the mirage sizzling and jiggering over the railway track. I arrive at my cutting, 'the fatal cutting’, and inwardly rejoice at the prosperous warmth all glowing before me as I descend and re-ascend the opposite side up to my shady, shelving sandstone rock, perched up high. I wipe the wholesome moisture from my pale brow, and having partaken at my billy (like a somewhat lengthy and affectionate kiss), I look up and down at my subject: is it worth painting? Why, of course, damn it all! That is providing I’m capable of translating my impression to the canvas. View the video clip with no sound and describe the story of Arthur Streeton’s painting in 5–7 points. View the video clip with sound and compare your story with the voice-over and list any differences. Describe the mood or feel the filmmaker creates using music, voice-over and sound effects (SFX). Whose point of view does the voice-over present and what are their feelings about the tragedy? Discuss and decide what dominates the painting — nature or the human tragedy? Explain the reasons for your decision. Find another painting by Arthur Streeton and write a 500-word text telling the story of the painting from the painter’s point of view. It may be in the form of a monologue, voice-letter, or letter.